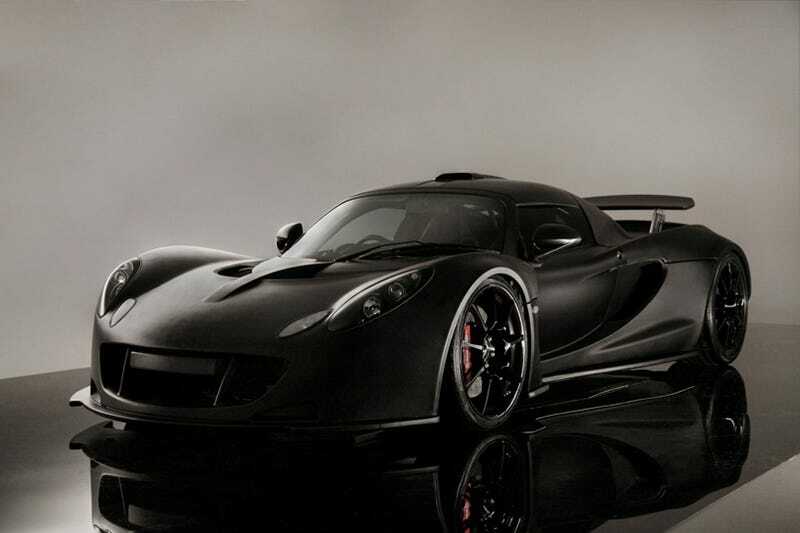 The Hennessey Venom GT is no joke. ZR1 Engine. Up to 1,200 HP. Less than 2,400 Pounds. Better power-to-weight than a Bugatti Veyron. Lotus-derived chassis. $600K pricetag. It's so batshit crazy the sales price includes an "orientation" session. The formula's roughly the same as when Carroll Shelby shoehorned American muscle into the heart of a British roadster, but this time the American muscle is an LS9 tuned to 725-1,200 HP and the British roadster is the tiny Elise. It's power-to-weight ratio is 0.302 in it's mildest trim, besting the 0.254 of a Bugatti Veyron. Putting that power to the ground will be a Ricardo six-speed gearbox with a little help from programmable traction control and an adjustable suspension. Bringing the beast to a stop will be Brembo brakes: 6-piston calipers up front/4-piston calipers out back with 15-inch carbon ceramic rotors. In order to make sure the car works as a complete package, John Hennessey told Jalopnik his staff has been running hundreds of miles on the car every day to make sure the Venom GT is a reliable tool for hunting Italian exotics. And with just ten sold per year at a price starting around $600K, it'll be as rare as it is fast.